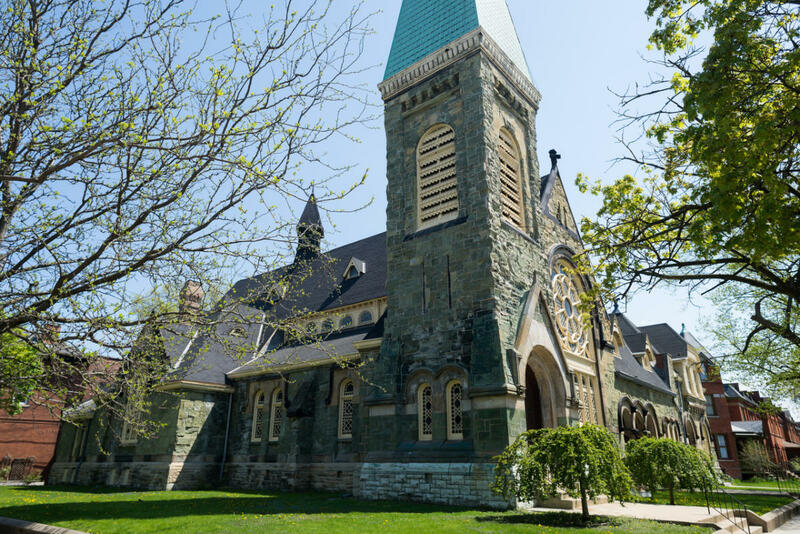 11211 S. St. Lawrence Ave.
"The Green Stone Church" nickname comes from the hue of the Pennsylvania serpentine limestone of its facade. The church of Romanesque design was built in 1882 to the plans of the town architect, Solon S. Beman. For much of its first quarter-century, the building sat unused as no one congregation could pay the rent required of Pullman. Following a much-publicized antitrust controversy, Pullman was forced to sell off most of the town, beginning in 1898, the year following Pullman's death. In 1907, the church building was sold to the Methodist congregation for $15,000. The entire Pullman neighborhood gained National Historic Landmark status in 1971 and became an official Chicago Landmark in 1972.